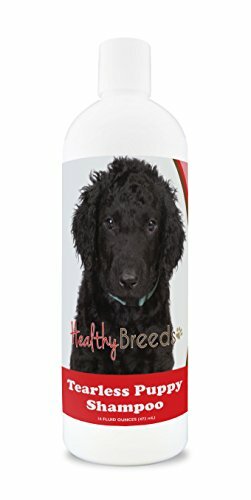 Healthy Breeds Tearless Puppy Shampoo for Curly-Coated Retriever - OVER 100 BREEDS - Nourishes & Moisturizes for Growth - Safe with Flea and Tick Topicals - 16 oz by Healthy Breeds at Annie's Dog Spa. MPN: 1068-curl-001. Hurry! Limited time offer. Offer valid only while supplies last. Healthy Breeds puppy tearless shampoo is a uniquely gentle, cleaning, and conditioning formula that will leave a dry coat soft, shiny and healthy. Healthy Breeds puppy tearless shampoo is a uniquely gentle, cleaning, and conditioning formula that will leave a dry coat soft, shiny and healthy. The shampoo contains Aloe Vera, lanolin and gentle proteins that leave a soft, fluffy coat. It is mild enough for use on a puppy's face over 4 weeks of age. A uniquely gentle shampoo that cleanses and conditions a puppy's skin and coat. Mild enough for use on the face of puppies 4 weeks of age and older. Formulated with the proper ingredients to maintain a moisturized and nourished coat as they get older. Contains aloe Vera, lanolin, and gentle proteins that leave a soft, fluffy coat. Safe for use with topical flea control products. No harmful chemicals or irritants. It can be used as often as necessary and will not strip the coat of natural oils.